As the spring season approaches, we can see brilliant colored, fragrant and attractive flowers surrounded with colorful soft and beautiful flying butterflies. Multicolored flowers and butterflies on a background of lush green grass make the perfect sight, soothing for eyes and soul. This list a collection of 12 rare-sighted and appealing butterflies from around the globe. The Richmond birdwing (Scientific name: Ornithoptera richmondia) is one of the largest Australian butterflies. They have a wingspan of up to 15cm in females and 13cm in males. This species is listed as Vulnerable in Queensland (Nature Conservation Act 1992). The male butterfly distinctively differs from the female one in appearance. The females either have brown or gray wings and the males have a black forewing with a distinctive iridescent green fore-edge. Battus polydamas antiquus is an extinct subspecies of the Polydamas Swallowtail from the Papilionidae family. The ground color of the fore and hindwings is black and the upperside of the forewings consists of a row of eight green spots. Sapho Longwing (Scientific name: Heliconius sapho) belongs to the family Nymphalidae. Their prime origin is Costa Rica. The caterpiller is quite unique in the sense that it’s only food plant i the Passion Vine called Pittier’s Passion Vine. This probably is the main reason behind the higher rate of extinction of such species compared with other butterflies as if the plant goes extinct the butterfly will surely follow. Spicebush Swallow tail belongs to the family Papilionidae/Swallowtails . Commonly found in woods, pastures and meadows during February to October, the butterflies are unique and attractive rapid flying caterpillars. The overall appearance of both the sexes is same. They are black with pale blue-green marginal spots and have a large orange spot along costal margin. Hindwing with single tail has a prominent greenish flush in males and reduced diffuse blue scaling in females. The Banded Peacock (Scientific name: Papilio crino) is a specie of swallowtail (Papilionidae) butterfly found in Pakistan, India, Sri Lanka and parts of South Asia. The beautiful butterfly with cottony or hairy scent-streaks is a solitary and a fast flyer. It flies high above the trees and the female lays eggs on leaves of the Satinwood tree. Occasionally it is attracted to bright flowers of plants on the ground. It is distinguished due to its color which is shiny fluorescent blue or green. The color depends on the angle of observation. The magnificent colors are due to scales in interior of its wings. There are spots in the bottom of its hind wings similar to eye spots. 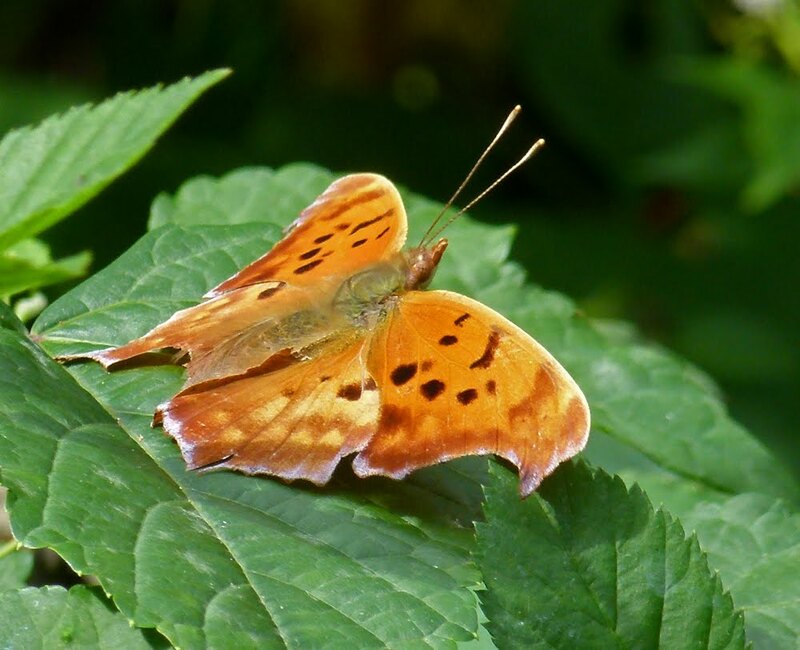 The Question Mark butterfly (Scientific name: Polygonia interrogationis) is a North American butterfly. The adult butterfly has a wingspan of 5–7.5 cm (2–3 in) and is seen from May to September. The silver mark on the hindwing is broken into two parts, a curved line and a dot, looking like a question mark that gives the species its common name. It is mostly black with a short tail in summers and turns to a lot of orange in winters with a longer, violet-tipped tail. This beautiful butterfly belongs to the Nymphalidae family. It is mostly found in Southern parts of the United States. They usually live in areas of low vegetation. They have white bars on the upper wing surface with prominently visible eyespots. They have a very unique and distinctive feeding pattern as they live on mud fluid and damp sand. Linea, the summer version of this butterfly summer version has light yellowish ventral wings.